This week's text is "Cavalry Crossing a Ford"
This little six-line poem was the third poem in the 1865 Drum-Taps and the first to present an image of troops in the midst of the war. But the imagery here is remarkably calm, and, unlike the prose descriptions of battle that appear in the prose Memoranda During the War, where the battles are often very specific and very bloody, the scene in this poem is oddly generalized and serene. The poem gives us no information about where we are geographically or why the troops are crossing a ford, nor does it even indicate whether we are watching Union or Confederate troops. Whitman has numerous very short poems like this in Drum-Taps, precursors to what in the early twentieth century would come to be called “imagist” poems—short, condensed, intense, terse observations that engrave themselves on the reader’s imagination. The sources of Whitman’s Civil War poems are numerous, and during the war he began drawing more and more on descriptions that soldiers in the hospitals provided him of their various experiences, often taking on their point of view and creating soldier-personae to narrate the poems so that we experience the speaker not as the Whitmanian “I” that we came to expect from his pre-war poetry, but rather as specific soldiers recalling war experiences. In “Cavalry Crossing a Ford,” however, there is no “I” but rather a kind of omniscient narrator who seems to see this cavalry from a heightened perspective, looking down on the maneuver as if from above. It is clear that Whitman borrowed key phrases—“long array,” “between green islands,” “taking a serpentine course,” “their arms flashing back the rays of the burning sun,” “guidons gaily fluttering”—in order to construct his poem, giving us a “bright” imagistic “picture,” and also offering us an early example of what would in the twentieth century come to be called “found poetry,” poems that are created by using text found somewhere else—in a newspaper or advertisement or law report or instruction manual—and refashioning those texts into poems by rearranging lines, phrases, and images. 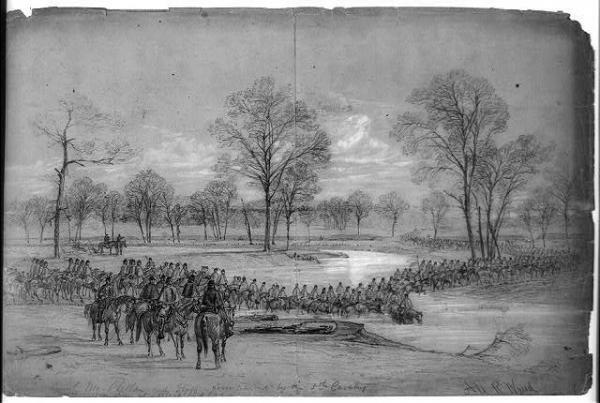 In the case of “Cavalry Crossing a Ford,” we might say that it was not until the late 1990s that we knew the specific place and reason for the event that Whitman’s poem recalls, but it would be more accurate to say that Whitman took a newspaper account of a specific event that occurred with Union troops in a specific place in Alabama in 1864, and then stripped that event of most of its identifying markers, leaving us with a striking and timeless image of soldiers moving in a kind of organic and synchronous movement with the landscape, their movements directed by the contours of the land as they follow “a serpentine course,” with each individual soldier melding into the “brown-faced men”: every single soldier merging with the group (“each group, each person a picture”), the group merging with the landscape. What is unspoken here but implied by the poems that follow, is that the landscape the soldiers move through now will eventually absorb many of those same soldiers, as the battles leave the dead to merge into the green islands and sink into the silvery river. In Memoranda During the War, Whitman offers us a similar vision of watching, “for more than an hour,” “long strings of cavalry, several regiments, very fine men and horses, four or five abreast,” an “inspiriting” sight, with “our men . . . generally well mounted, feel[ing] good, . . . young, gay on the saddle, their blankets in a roll behind them, their sabres clanking at their side.” But what Whitman includes in his prose but leaves out of the poem is an equally powerful “line in long array” heading in the opposite direction: “Then just as they had all pass’d, a string of ambulances commenc’d from the other way, . . . slowly wending along, bearing a large lot of wounded to the hospitals.” For every inspiriting line of cavalry heading one way, there is an equally dispiriting line heading back the other way, bearing the wounded and dying to the hospitals, where Whitman would position himself, and which he would come to see as the war’s very cynosure. The guidon flags flutter gaily in the wind. On New Year’s Eve, 1995, just after the Dayton Peace Accords were signed, I traveled to Županje, Croatia to watch American peacekeeping forces cross the Sava River into Bosnia—30,000 soldiers and hundreds of tanks, Bradley armored vehicles, and Humvees. The bridge across the river had been destroyed at the beginning of the war, and now speedboats held in place the longest floating bridge built by the U.S. military since the spanning of the Rhine in World War II. On the riverbank, above the roar of idling vehicles and helicopters hovering overhead, I heard the commanding officer say that he was having fun. This seemed to hold for the townspeople watching the soldiers follow a serpentine course across the bridge, which brought to mind Whitman’s “Calvary Crossing a Ford.” Moving troops has been integral to warfare, and war literature, since Greek forces sailed to Troy, and when the Iraqi Army used a floating bridge to cross the Euphrates River in its recent campaign to retake the strategic city of Ramadi, I realized that Whitman’s genius lay in his ability to find timeless images for basic facts of life—in this case, a military operation. That Whitman adopted the outline of his poem and some of its language from a newspaper account reminds us that he possessed a magpie sort of imagination, gathering phrases and stray bits of language from what he read or heard, then arranging and rearranging them into poetry—a precursor of a certain strain of contemporary poetic practice. An exercise in erasure, for example, in which words are removed from an existing text, which may be quite banal, until a poem emerges, follows Whitman’s lead in recognizing that other meanings may lie buried in otherwise ordinary language. The artist is the one who can reveal beauty hiding in plain sight. “Immature poets imitate; mature poets steal,” said T. S. Eliot; “bad poets deface what they take, and good poets make it into something better, or at least different.” One must thus admire Whitman’s theft in “Cavalry Crossing a Ford,” which went undetected for over a century—long enough to ensure its place in the literary canon. But the rise of the Internet and the development of software to check for plagiarized content make it difficult to disguise material lifted from another source—a challenge, one imagines, that Whitman might have welcomed. For poetry demands of its practitioners the ability to overcome resistance. No doubt he would have devised creative ways to make use of found materials on the World Wide Web. Stevens concludes that “This is old song/ That will not declare itself…” It may be that in this instance “meaning escapes,” but in fact he has captured an essential truth about what soldiers experience in war: they belong to a collective entity, designed to erase any hint of individuality, and yet it is as individuals that they will meet their fate. Each one dies alone. Whitman was a war correspondent as well as a war poet, so he was aware as he wrote his dispatches for newspapers that others might use phrases from his reports just as he used the phrases from a New York Herald report to write “Cavalry Crossing a Ford.” How many “found” poems are there in today’s war reports from the various wars going on in the world now? Can you construct a poem out of a recent newspaper war story? Share it with us. Answer this question in the Comment box below or on WhitmanWeb’s Facebook page.